April 12, 2019 By Todd Burgreen & filed under All Articles, Shotguns, Weapons. Two of Remington V3 TAC-13’s greatest attributes are its compactness matched with its fearsome close-range power. Whatever the term used—combat, tactical, self-defense—shotguns can be had in various forms ranging from double-barrel to pump-action, semiautomatic, and even lever-action. Recently, a new genre has arrived labeled non-NFA “pistol-grip firearm.” Make no mistake, these are true smoothbores chambered in potent 20 and 12 gauge. 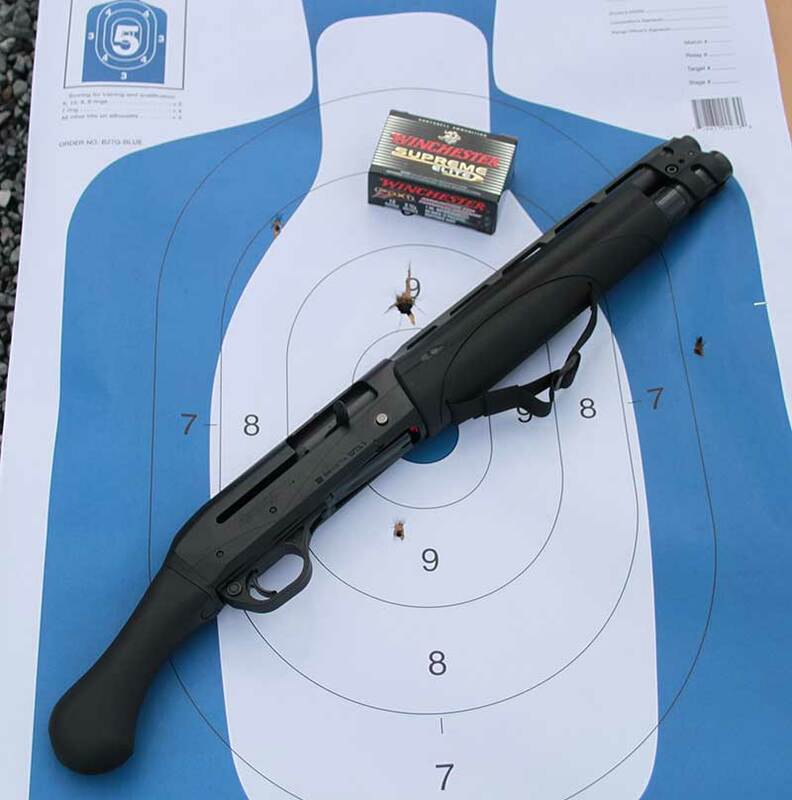 Remington and Mossberg have been leading the way in this increasingly popular category, outpacing many other firearms sales with their pump-action 590 Shockwave and 870 TAC-14s. Is this surge based on performance or thumbing your nose at existing regulations? Let’s remember all the “expert” sneers when .410/.45 Colt revolvers arrived. The same phenomenon was present with braced pistols chambered in rifle calibers. 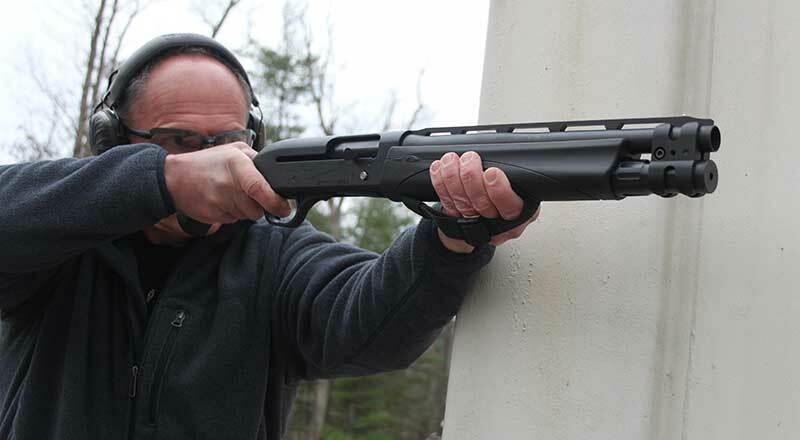 This article will strive to shed more light on “pistol-grip firearms” shotguns. Remington just reaffirmed they are all-in with pistol-grip firearms by raising the bar even higher with the new V3 TAC-13, the first production semiautomatic in this format. Semiautomatic assists with recoil and, of course, negates the need to work the action for follow-up shots. V3 TAC-13 is surprisingly portable and flexible in roles it can fulfill. 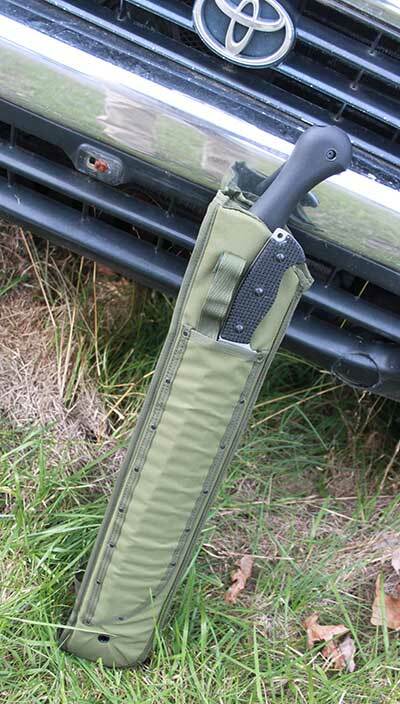 Voodoo Tactical scabbard transports both machete and TAC-13 while hiking, camping or storing in a vehicle or house. The V3 TAC-13 features Remington’s proven reliable recoil-absorbing VersaPort® gas system, which emerged in 2010 as Remington’s response to others chipping away at their sporting shotgun market share. The VersaPort semiautomatic system has been proving itself in the demanding waterfowl and bird hunting arenas ever since, garnering much praise. The VersaPort design is simplicity bordering on brilliance. As explained to me at a recent Remington law enforcement event in Utah, gas pressure is regulated by shot-shell length, eliminating complex springs, gaskets, etc. Longer shot shells cover ports, eliminating the amount of gas acting on the bolt, with shorter shot shells exposing more ports for the required effect to cycle the gun. 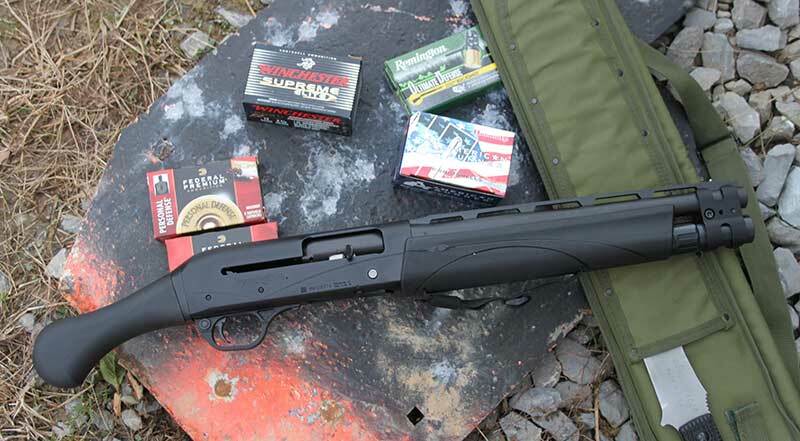 VersaPort enables a shotgun to cycle everything from 3.5-inch goose-hammering loads to 2.75-inch one-ounce target loads, all the while taming recoil since gas pressure is regulated properly. An added benefit with the VersaPort is its location near the front of the receiver, creating a better balanced and handling weapon. Why am I taking the time to explain this? It is important for a weapon configured such as the V3 TAC-13, where users may choose full-powered loads, birdshot, low-recoil buckshot, or slugs. Remington V3 TAC-13 is treated as a firearm. It is not an NFA Class 3 Short Barreled Shotgun even though it sports a 13-inch barrel. 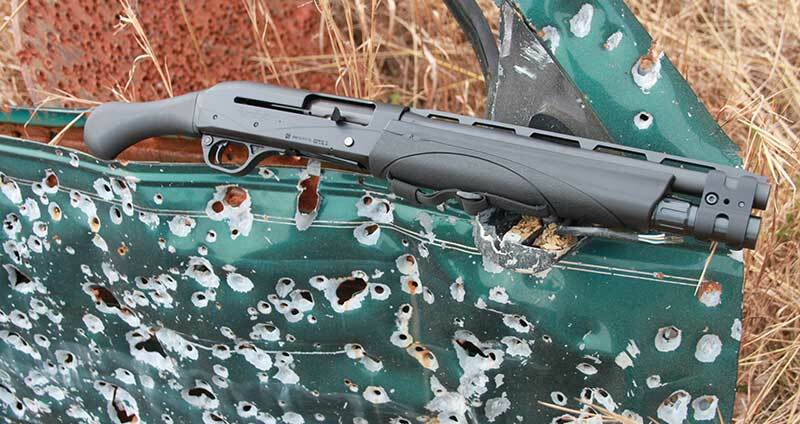 Remington’s short-barreled 870 TAC-14 has become popular as a compact yet powerful personal defense option. The V3 TAC-13 12-gauge takes this a step further with its 13-inch cylinder bore barrel and birdshead grip with an overall length of only 26.5 inches. The V3 TAC-13 can handle 2.75- or 3-inch shells with a capacity of five plus one. The aluminum receiver and lightweight contour barrel add up to a weight of 5.9 pounds. A matte-black receiver and furniture finish off the V3 TAC-13’s aesthetics, along with a forend strap to manage hand placement. As discussed earlier, the V3 TAC-13 can be purchased with basic paperwork associated with most any other over-the-counter firearm purchase. The Gun Control Act of 1968 that defines what a short-barreled shotgun consists of is the key. Most efficient way to place lead on target is to orient Remington V3 TAC-13 slightly below eye level. Forend strap minimizes upward climb when fired, especially when combined with proper technique. A shotgun that is manufactured from the start with a pistol grip and maintains an overall length greater than 26 inches is considered a firearm—not an NFA regulated short-barreled shotgun even with the V3 TAC-13’s 13-inch barrel versus the standard 18-inch barrel associated with stocked shotgun requirements. While the non-NFA “pistol grip firearm” might be a recent phenomenon, the non-stock shotgun as a specialized tactical tool had its inception decades ago via several entities/roles such as the U.S. Marshal Witness Protection teams, various law enforcement units specializing in stake-out surveillance, and high-value prisoner transport teams. Each of these listed appreciated the close-range firepower potential of the compact shotgun. While an option, firing from the hip is not the best way to deploy the Remington V3 TAC-13 effectively. Bringing the V3 TAC-13 to slightly below eye level, indexing with your body toward the target, and keeping it out in front away from your face produce the best on-target results. Even in today’s politically correct environment, it must be stressed that the V3 TAC-13 12-gauge is best used by persons of stout body and, more importantly, mind. There is no shame in choosing another weapon type if you are not capable of managing the recoil physically or the mental commitment of relying on a short-range bludgeon. Remington V3 TAC-13 is a modern blunderbuss meant to be deployed at close range by users capable of wielding its power. Echo Valley Training Center’s range vehicles proved valuable in wringing out the best techniques to use in a CQB environment. Recoil is managed by maintaining forward pressure on the forend in conjunction with pulling rearward on the pistol grip. “stretching” the V3 TAC-13. 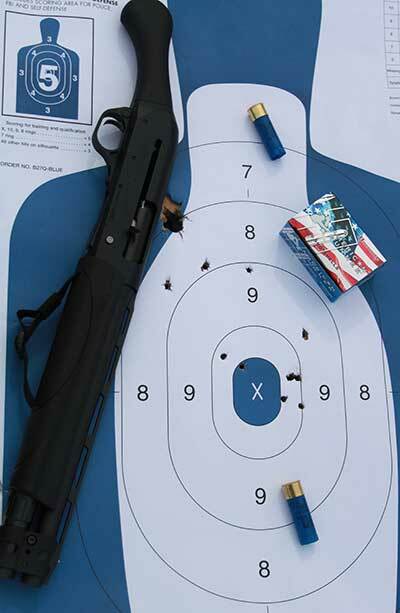 Proper technique is important, as well as taking advantage of the growing amount of low-recoil shotgun rounds becoming available. The Remington VersaPort operating system is key here for reliability and flexibility of choosing ammunition. There can be no compromise or concern in terms of this. The V3 TAC-13’s semiautomatic action did make a difference in felt recoil, especially based on prior experience with pump-action pistol-gripped shotguns. This same prior experience also made it obvious that the semiautomatic Remington stayed on target better, with multiple rounds fired more quickly and naturally due to not needing to rack the action as with a pump-action. There is something reassuring about the power of a shotgun for any close-range engagement, which is what most private citizens and peace officers face. In terms of personal defense, buckshot loads predominate, but load options do exist. Fortunately, the V3 TAC-13 is a semiautomatic that can handle all types. Remington V3 TAC-13 provides 5+1 semiautomatic 12-gauge firepower in a compact package. Shotgun loads such as Hornady American Gunner, Remington Ultimate Defense, Winchester PDX1, and Federal FliteControl buckshot are perfect matches for V3 TAC-13 to maximize its potential. There are various buckshot loads and sizes. We will confine our discussion to #00 buckshot and #4 buckshot. #00 is generally loaded with eight to nine .33-caliber pellets weighing 54 grains each. #4 buckshot utilizes .24-caliber pellets weighing 21 grains each, with up to 27 pellets on board depending on the brand. Some advocate the use of #7.5 or #8 birdshot in a shotgun for use in a home to limit chances of overpenetration. A column of birdshot at close range such as across a room is lethal due to not having time for the shot column to disperse, yet penetration characteristics are minimized due to the light weight of individual pellets. On the other hand, birdshot may not penetrate enough to adequately put down an aggressor. The Remington V3 TAC-13 was tested with Hornady American Gunner Reduced Recoil #00, Remington Ultimate Defense #4 buck and Federal Premium Low Recoil FliteControl #00 buckshot (9 #00 pellets). Federal Personal Defense 12-gauge #00 with FliteControl wad performance at ten yards. This load redefines buckshot patterning characteristics. The Federal Premium buckshot load utilizes a special wad for tighter buckshot patterns and thus longer effective range. But the role of the V3 TAC-13 as a close-range blunderbuss could justify the use of “normal” patterning buckshot represented by the Hornady American Gunner or Remington Ultimate Defense loads. The newer buckshot loads with specialized wads could maintain too tight a pattern, limiting the attribute of lead dispersion at distances most associated with practical shotgun deployment. For example, the Federal FliteControl at 20 yards produced patterns in the six-inch range. 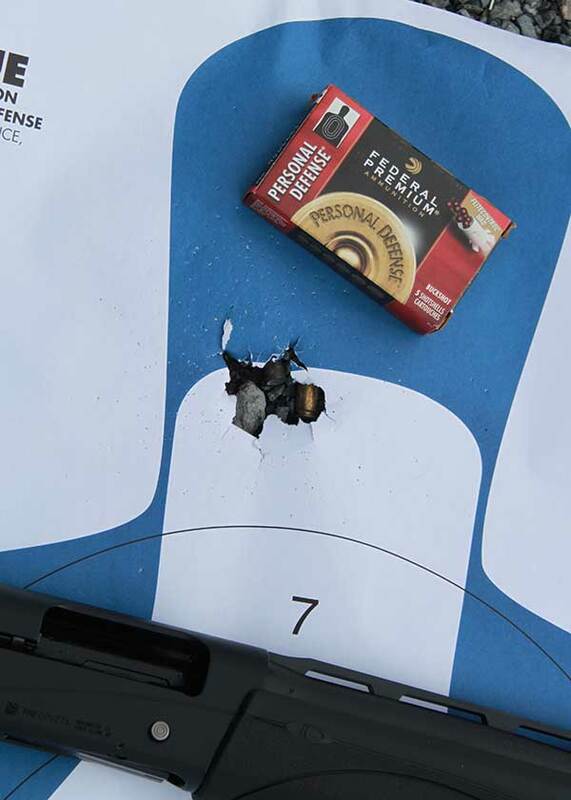 Standard buckshot generated a five-inch pattern at ten yards. Users will have to determine what best suits their needs. Winchester PDX1 combines slug and buckshot into one potent shotgun load. 10- and 20-yard patterns out of Remington V3 TAC-13. Supplementing the buckshot for testing was the Winchester PDX1 12-gauge load, combining a one-ounce slug and three #00 pellets. The PDX1 load harkens back to the “buck-n-ball” loads used by our forefathers against the British in the Revolutionary War and each other during the Civil War. Winchester PDX1 loads stretch preconceived 12-gauge lethality notions even farther, with their combination of slug and buckshot. 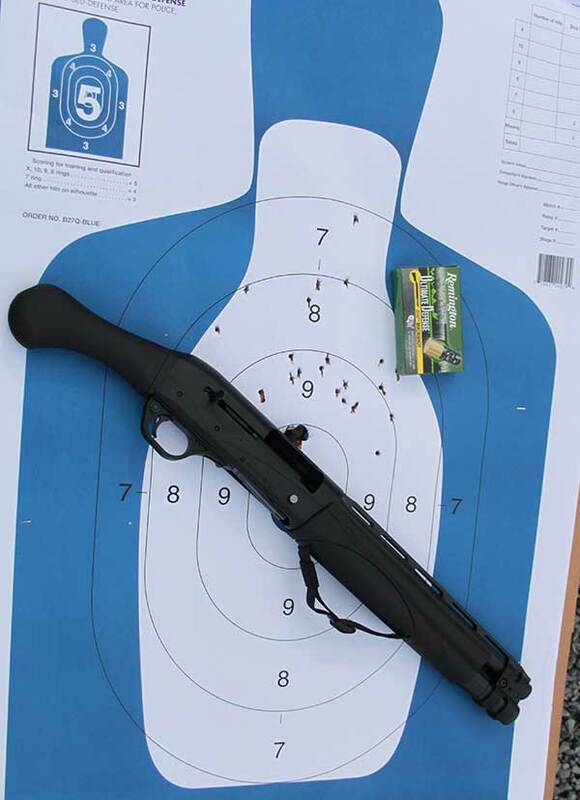 Range testing of the PDX1 raised eyebrows, with its performance combining the best of both worlds for the combat shotgun—single projectile performance and ten-inch buckshot pattern spread out to 20 yards. If only one load is possible for use in a tactical shotgun, the Winchester PDX1 may very well be it. The Remington V3 TAC-13 is a close-range hammer and was treated as such for this review. It was evaluated via drills involving moving between barricades (think emerging from a bedroom into a hallway). 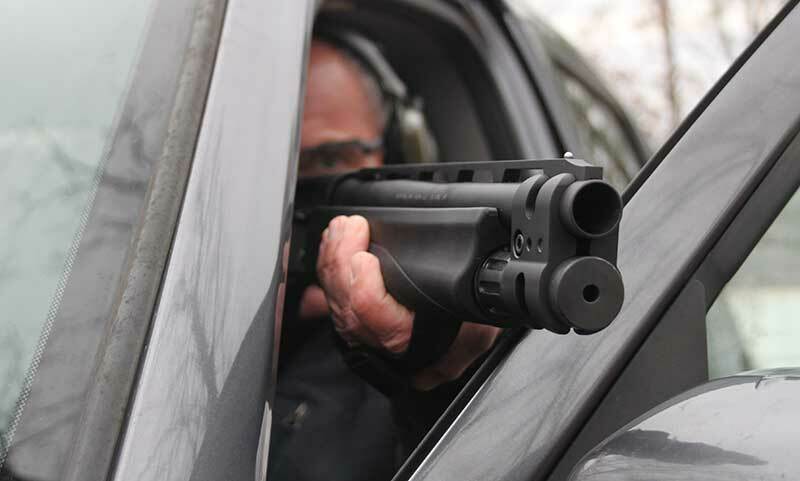 Another niche role the pistol-grip shotgun has found in the law enforcement arena is a CQB force multiplier, especially in and around vehicles. Remington Ultimate Defense managed recoil. #4 buckshot at 20 yards from V3 TAC-13. Echo Valley Training Center (EVTC) range cars were utilized to simulate responding to a bad-breath distance ambush. A couple hundred rounds comprised of buckshot, birdshot, and even slugs were fired from the Remington V3 TAC-13. No issues were encountered. This same level of performance was witnessed at the Remington Utah event mentioned earlier. The V3 TAC-13 present was in constant use all day with hundreds of rounds fired by the dozen or so participants. The Remington V3 TAC-13’s simplicity, reliability, and raw power exemplify why the 12-gauge continues to attract users. Your primitive side is ignited as you know an encounter will be a close-range affair. If the range is point blank, the near ¾-inch diameter bore is devastating. Buckshot’s natural dispersion as it travels downrange creates a firepower “cone.” Eight or nine .33-caliber pellets smashing into a target are fight stoppers. The Remington V3 TAC-13 is a specialized weapon created for close-range firepower superiority. Results of two rounds of Hornady American Gunner low recoil #00 from 20 yards.